I'm a little bit tired of the fantasy novels filled with fierce female heroines, so I was a little wary going into this one. It's not that I don't want to read those kinds of books, I do, and I think they are super important, I just felt like the story didn't need to be carried by these types of characters. And actually, I would say that in the case of this book, the heroines were a major part of the book, but it didn't feel like they were just there to fulfil that category in an otherwise ordinary fantasy. 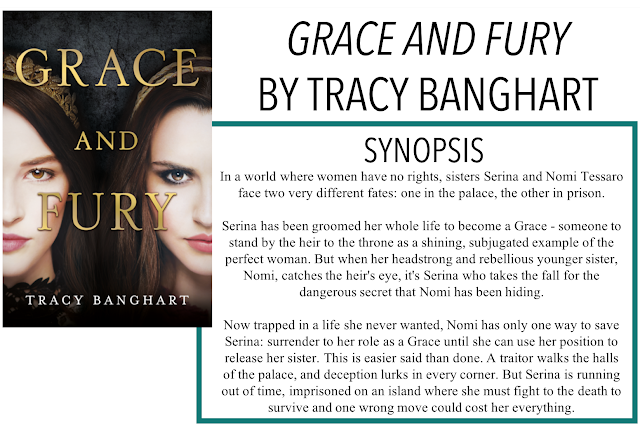 I am back with another book review, Grace and Fury by Tracy Banghart. Thanks so much to Hachette Books for sending me a copy of this book for an honest review, as always, all opinions are my own. This story follows two sisters, Nomi and Serina. 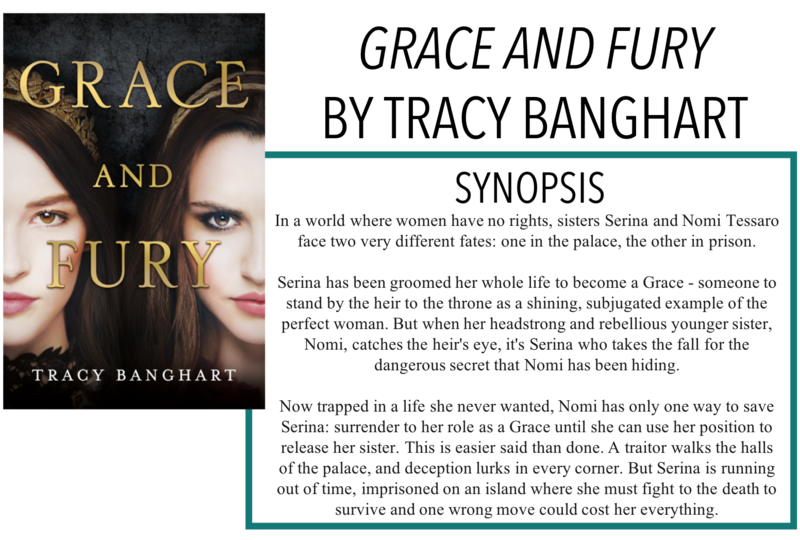 Set in a world where women are refused education, imprisoned for learning to read and write, Serina has been trained since birth to be one of the future King Malachi's Graces, especially the Head Grace who will produce heirs for the kingdom. Nomi has been trained as well, but to be Serina's handmaiden when she is chosen as a Grace. All seems to be going well until Nomi is chosen as a Grace instead of Serina. Then, Serina is sent to a deadly prison island for a crime she didn't commit. With the Heir's birthday soon approaching, Nomi is running out of time to save her sister and free herself from a life she never wanted. Hoping she can trust Asa, Malachi's younger brother, Nomi sets out a plan to free them both. When I first started reading this book, it felt like a higher stakes version of The Selection. There are a group of girls who are competing to be chosen, except both the king and his son are not great people. They are depicted as violent, oppressive, and generally not very friendly. There is a bit of tension between Malachi and Asa, and you (and Nomi!) don't really know who to trust. One says the other one is jealous, the other that the other is a killer. There are some really great swoon-worthy moments throughout the book as well, I look forward to the sequel to see how Banghart develops the budding romances. These were also interwoven with some history of the world and the oppression of women. We learn that at one point, women ruled the world, but were overthrown and betrayed by the men closest to them and were forevermore suppressed out of fear. I found this aspect really interesting and would love to see it further developed in the sequel. I will say that there is very little world-building, which to be honest, I can live without, but I just had a hard time picturing everything physically. I think that even the inclusion of a map would have made things easier to understand. I think this might be an issue for some readers, but for me, I didn't mind not having a ton of details on the world. It took me a few chapters to get into the story, but once the plot got rolling, I was pretty much hooked. Overall, I enjoyed this one more than I thought I would and can't wait for the sequel!